Magnificent villa 166 m2, 10/12 p, private heated pool 5x10m, wifi near the golf courses and the beach. 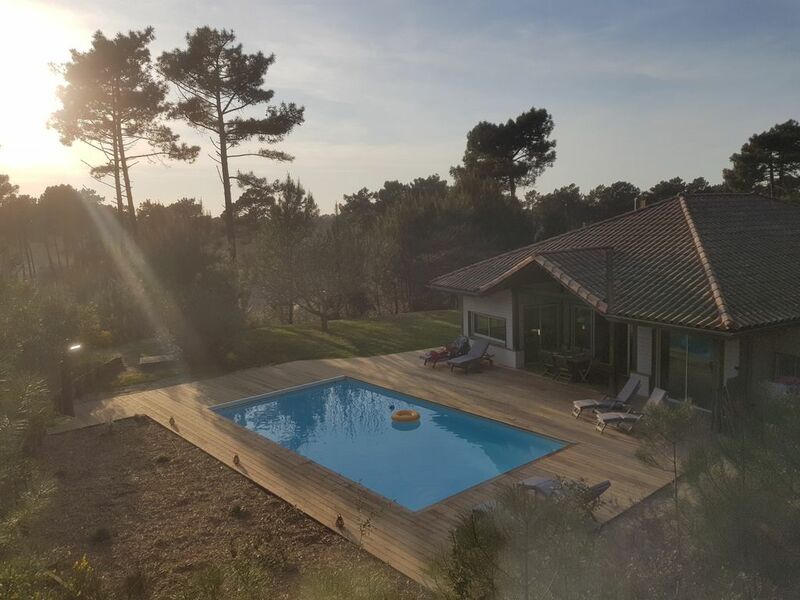 On the edge of the forest, near the beach and 2 golf courses 9 and 18 holes. Garden furniture, barbecue, deck chairs. Free WIFI. Garage in the basement. Large living room with bay windows overlooking the terrace and pool deck with heated shutters, fireplace, fully equipped kitchen. Bedroom 1: bay window overlooking the pool, 160 bed, closet, bathroom with spa bath, toilet. Bedroom 2: 160cm bed, fitted wardrobes, en-suite shower room, WC. Bedroom 3: 160 bed, cupboards. Bedroom 4: 2 beds 90, cupboards. Bathroom. Separate WC. Upstairs: access to mezzanine with 2 beds 90. Bathroom with toilet. Additional opportunity for 2 people with the sofa bed in the lounge. Lovely house- we had fun!! We have had a great time here. The house really suited us - tucked away in a lovely place in the trees. But still sunny. Very nice pool. We liked the decor and the way it looked. The electric BBQ was a really good idea and we used it! Thankyou. We'd love to come back. We had the pleasure to stay in this amazing villa for 2 weeks. Two family's (10 in total) with lots of space. The villa was amazingly equipped and beautifully decorated with a secluded feel as it is tucked away. Kids loved the swimming pool and the sun shone in the garden all day. Fabulous holiday can't wait to return. Lage der Anlage war sehr gut. Haus war lieder nicht greinigt.Pool toll und beheizt aber wahrscheinlich nicht regelmässig gereinigt, weshalb er 2 Tage nicht benutzbar war! Alle Geräte und Möbel mit deutlichen Gebrauchsspuren. Insgesamt war der Preis nicht gerechtfertigt. Natürlich ist dies keine objektive Betrachtung, aber der erste Eindruck: Haus ist nicht gereinigt...…. Je tiens à préciser qu'en 10 ans de location aucun locataire ne s'est jamais plein de l'état de propreté de la villa. Nous faisons passer des professionnels entre chaque location. Pour le jardin et la piscine nous faisons également intervenir une société spécialisée. Je suis très surpris de ce commentaire d'autant plus que les locataires ne sont sont pas manifestés durant leur séjour. Nous mettons tout en oeuvre afin que celà ne se reproduise plus. La villa est parfaite : très lumineuse, très bien décorée et parfaitement équipée pour 10 personnes. La piscine et la terrasse sont très agréables ! Nous avons passé un excellent week-end ! Super week-end dans les Landes ! La maison est juste parfaite pour un séjour entre amis et très bien équipée.